Much to my surprise last week was an extremely busy week for my options activity. There were 6 positions that either expired or were closed, 1 put ending in the money, and a huge 9 positions being opened up. The closed positions from last week provided nearly $500 in option premium. Many of the new positions were standard wash, rinse repeat put options where I'm setting myself to buy shares in dividend growth stocks at a discount or earn a solid return. 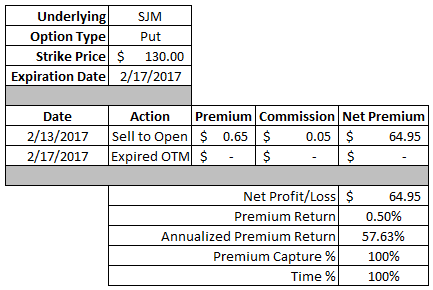 I've been using that strategy over the last 6 months to generate over $3,700 in option premium. Those will be reported in this post along with the closed positions. However some of the new positions need a bit more of an explanation so a post with all of the details will be coming out later this week. Now, without further ado let's look at some of the option moves from last week. Visa (Stock Analysis) has been a favorite of mine to sell put options against because of the relatively large premium that's been available. Unfortunately with the share price now up over $87 that time has probably come to an end because I'd like to purchase shares below $80 and preferably in the mid $70s. Oh well, it's been good while it lasted and other opportunities are sure to come. The net profit on this contract worked out to $73.00. Based on the $8,150 of capital "at risk" that's a 0.90% return. The annualized return works out to 16.8%. 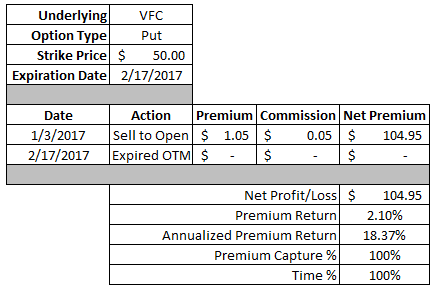 Since this contract went to expiration I captured 100% of the profit potential in 100% of the time. Johnson & Johnson is another company that I've been using recently to generate option premium. The share price kept hanging right around the high end of my fair value range which set things up nicely. However, much like Visa that time might be over after Johnson & Johnson's share price climbed higher after the latest bid for Actelion. Johnson & Johnson's share price had been flirting with my strike price until late in the contract. That worked out well for me since I was able to just let the contract expire out of the money. The net profit on this trade came to $109.95 which is a 0.97% return based on the $11,300 of capital used to secure the option. That worked out to an excellent 21.7% annualized return. I took a bit of a flyer on this contract in order to try and capture what I felt was "free" premium. I opened this position on Monday of last week because the pricing of the option just didn't seem right. It was pretty wide markets so I figured it couldn't hurt to throw in an trade near the ask price and surprisingly got filled. At the time Smucker's share price was hovering around the $136/7 area so I was getting nearly 5% downside protection in exchange for some decently solid premium. J.M. Smucker announced earnings on Friday and while the share price sold off the strike price of my put option was never in jeopardy. I was able to collect a net profit of $64.95 or a 0.50% return based on the $13,000 of capital in play. Since that was earned in just 5 days that's a whopping 57.6% annualized return. I legged into this covered strangle, i.e. I opened the put and call options at different times, because I hadn't previously owned shares. However, once my January put contract on V.F. Corporation expired in the money and I became an owner of 100 shares it made sense to enhance my put by making it a covered strangle. V.F. Corporation's share price had been flirting with my $50 put strike for a good portion of the time the contract was open. Luckily, or unluckily, for me V.F. Corporation announced decent earnings on Friday which sent the share price higher and between the 2 strikes of my covered strangle. That meant that I got to keep the full option premium from both contracts as profit. The total profit on this portion of the trade worked out to $104.95. Based on the $50 strike price that's a 2.10% return. The annualized return works out to about 18.4%. The call option portion of the covered strangle wasn't quite as profitable but it still offered a good return. The net profit came to $59.95 which is a 1.09% return based on the $55 strike price. On an annualized basis that's a 17.2% return. Combined the covered strangle produced profits of $164.90 which can be used to reduce the cost basis on my position. Prior to this I owned 100 shares of V.F. Corporation at $53.50 per share. That's now reduced to $51.85. I'll be on the lookout for other opportunities to open another covered strangle position. I had originally bought this call option as part of a more complex Jade Lizard that I had opened in Visa. Don't worry I'll go over this in more detail in the next day or two since I opened one up in another underlying. I purchased this call option for $58.79 after commission. On the sale I received $142.00 back netting me a profit of $83.21. Based on the $8,600 of capital that's a 0.97% return or 20.3% annualized. 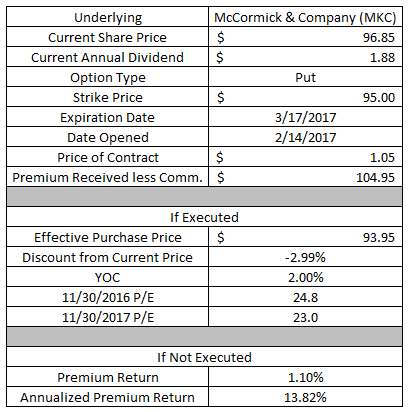 I've had my eye on McCormick & Company for a long time, but you rarely see it go on sale and typically the best valuation that you'll find shares trading at is the high end of fair value. It's a shame, but that's the price of investing in a ridiculously high quality and growing consumer staple. If McCormick's share price falls below $95 then I'll have to buy 100 shares of the company for the strike price less the premium received. So my effective purchase price would come to $93.95 per share. That's about a 3% discount from where the shares were trading at the time I opened the contract. In my eyes that's an okay valuation for McCormick, not great but okay. The trailing P/E for fiscal year 2016 would be 24.8x and looking to the current year ending 11/30/2017 the forward valuation would be 23.0x. The yield on cost at that purchase price would be 2.00% based on the current $0.47 per quarter payout. If McCormick's share price remains above $95 then I'll get to keep the full option premium as profit. Based on the $9,500 of capital required to secure the contract that's a 1.10% return or 13.8% annually. 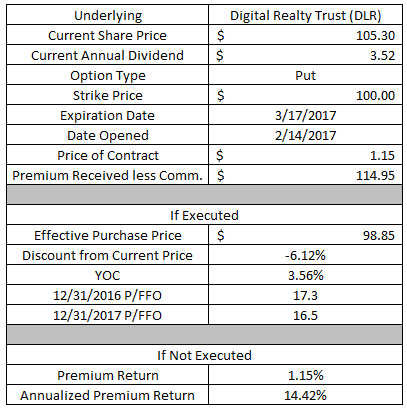 Digital Realty Trust is a company I've long had my eye on, but kept missing opportunities to buy shares. Unfortunately the run that REITs have had has made that even more difficult. If DLR's share price falls below $100 then I'll have to purchase 100 shares that price. Although since I've already received the premium my effective purchase price would be reduced to $98.85 per share. That's about a 6.1% discount from the share price at the time the contract was opened. At that price the valuation would be decent based on the P/FFO ratio. Based on fiscal 2016's core FFO the valuation would be 17.3x and at the midpoint of managements' guidance for 2017 the P/FFO would be 16.5x. The yield on cost at that purchase price would be 3.56% although DLR is due for a dividend increase this month which will boost that up if one is indeed announced. If DLR's share price remains above $100 then I'll get to keep the full $114.95 option premium as profit. 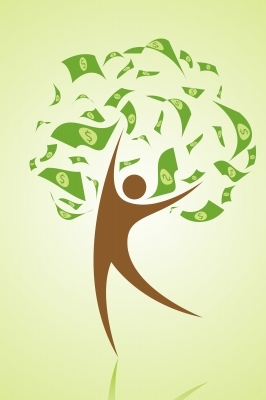 Based on the $10,000 in cash to secure the put option that's a 1.15% return. Since that would be earned in just over 1 month the annualized return would be 14.4%. This next one was a bit of a different option move than I normally make. Typically I sell OTM put options, but this time I saw a chance to be more aggressive and went ITM. Flowers Foods share price sold off hard after releasing earnings, ~8% if I remember correctly, which seemed a bit extreme. If Flowers' share price remains below $20 then I'll have to purchase 100 shares at the strike price. Since I received the $119.95 via option premium my effective purchase price would be $18.80 per share. That's about a 3.9% discount from the current share price. The valuation there doesn't look incredibly compelling, especially since earnings are forecast to drop slightly for the current year. The trailing P/E would be 20.7x while the current year estimated P/E would be 20.9x. What really made this an intriguing move is that the implied volatility really jumped up after the 8% post earnings decline. If Flowers' share price climbs back above $20 then I'll get to keep the full $119.95 option premium as profit. Based on the $2,000 to secure the contract that's a 6.0% return. On an annualized basis that would be a 108% return. 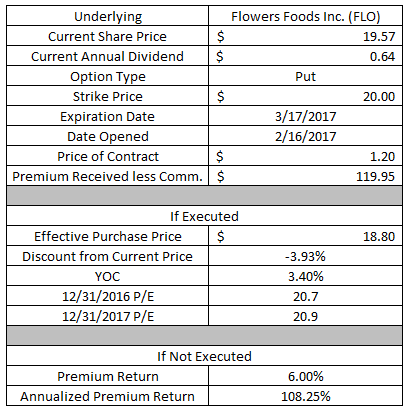 Since I'm not really interested in owning Flowers Foods for the long term I'll likely be closing this contract out early unless we see a big rebound in the the share price. However, even if Flowers just sits at the current level until expiration the contract would only be valued at $0.43 at expiration so I could still lock in a solid gain. I was trying to roll this contract forward all week, but just couldn't get filled. I always want to receive a credit, i.e. take in more premium, whenever I roll a contract, but that proved to be quite difficult because UPS' share price was well below the $115 strike. So I'm now the proud owner of 100 shares of Big Brown. Since the current share price is around $107 there isn't much I can do with the position at this time. I'll probably look to see if there's a covered strangle opportunity where if I can still lock in a gain, but likely I'll have to wait until the share price is at least back up near $110. Another option is to sell another put contract to try and lower my cost basis either through the adding additional shares at a lower price or the additional option premium. Thus far in February I've been able to generate $1,078.37 in profit via closed/expired options. Year to date I've collected $2,707,.76 in option premium profit. Looking forward to next week there's only 2 contracts that are due to expire. My $104 put in PepsiCo (Stock Analysis) and my $53.50 put in Starbucks. If all goes to plan then I'll just sit let these contracts go through to expiration and end OTM so I can collect the full option premium. Wash, rinse, repeat. I like the strategy. i find that most of my options transactions are repeats month-over-month. I really like the simple wash, rinse, repeat set up but man this seemingly endless rise in the markets is making it difficult. You either have to take in less premium or be willing to accept higher valuations or move closer to ATM. It's getting quite frustrating but one day, hopefully soon, we'll actually see at least a modest pullback to increase IV and premiums and bring down the valuations. can you write somethings about the scenarios that can lost money using your options stratify? you can not always get 100% winning and never lost money, right? Sorry that I'm just now getting to your comment. Regarding losing money with options yes it's a very real possibility. However, the way I approach things, especially in my Rollover IRA is a bit different from just straight up trading options. I only sell options on businesses that I want to own anyways so the risk is that I'm buying shares of businesses that I like but at a lower price. So from my perspective the risk isn't that bad. Where big risk comes in is if the company has a big move either higher or lower, then I'll either be buying shares at a higher price than the market is currently offering or I would have missed out on the gains. However, in the case of a move to the downside that risk would still be there if I owned the shares instead of using options so it's essentially a wash. If you'd like any other information or have any other questions please reach out to me via comment or email.